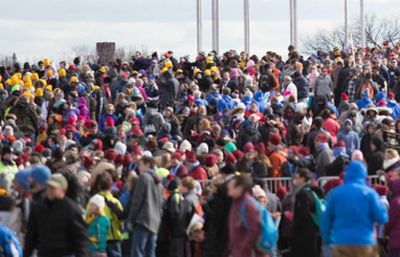 Hundreds of thousands are reported to have marched on Washington DC on Friday (January 27 20170 to campaign for an end to abortion at the annual March for Life. Among the event’s prominent speakers was the United States Vice President Mike Pence, who said that “life is winning again in America”. He promised that the US Government would do everything in its power to promote the sanctity of life. The world’s largest pro-life event attracted huge crowds, though an overall tally was not recorded. Pence and Kellyanne Conway, a high-ranking advisor to the President, reaffirmed the US Government’s position on pro-life issues. “Be assured”, Pence said, “we will not grow wearied, we will not rest until we restore a culture of life in America”. March for Life President Jeanne Mancini said that the huge number of people attending the march was not the most important statistic. “The only number that I care about, and the number that all of us here care about, is 58 million”, she said. She continued: “We stand for the little innocent children who have lost their lives and we stand for their mothers who regret being involved in abortion”. Faithwire’s Senior Editor Billy Hallowell reported from the event that once the march began, supporters streamed across the starting line for well over an hour straight. Mancini also took the opportunity to champion the choice of “noble and heroic” adoption for those mothers who do not feel they can raise their child. But she highlighted that there are only 22 000 infant adoptions in the US annually, compared to over 1 million abortions per year. Pro-lifers, she said, needed to continue “choosing life, choosing adoption”. Chelsea Patterson, who works on adoption and foster care policy in Congress, had her birthday on the day of the 44th annual march. She wrote a highly moving and personal account of her support for adoption over abortion on The Gospel Coalition website. In a piece entitled ‘Today Is My Birthday Because My Mom Chose Life’ she wrote that: “The terrified young woman who gave me life is my hero. She added that many women need loving conversations in order to convince them to make “the same life-saving decision I’m eternally grateful my mother made for me”.